The only two major cons this Zojirushi NS-LAC05 rice cooker has working against it is its small cup capacity and no steaming feature. 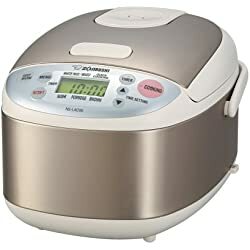 Other than that, this Zojirushi 3 cup rice cooker excels in almost every area and is worth the high price tag, (granted folks plan to use it to cook rice often). If not, perhaps a less expensive rice cooker is a better choice. Having stated that, for daily use the NS-LAC05 is perfect for making white rice, brown rice, mixed rice, oatmeal, and porridge. The cooker uses Fuzzy Logic technology which explained on other pages monitors how the rice is cooking adjusting temperature and cooking time instead of just rapidly boiling it until there is no more water left. This means that every batch of rice will be consistent every time. The easy to use digital interface features a large LCD panel which allows folks to select the grain type as well as programming a start/finish time for added convenience. When the rice is finished the Zojirushi NS-LAC05 will play a little jingle and switch into a warm mode keeping the rice moist, fluffy, and at a ready-to-eat temperature until the user is ready to serve. The inner bowl is non stick and is easy to clean using a soft sponge with mild soap. The unit comes with a manual, measuring cup, and plastic rice spatula for scratch proof serving. Overall, this Zojirushi rice cooker is worth the investment as it takes the guess work out of cooking rice and was specifically designed to be as fool-proof as possible! The only thing folks will have to bear with is the long cooking times (especially for brown rice). Remember that this cooker is not only soaking the rice before fully cooking it, but is also using technology to sort of “slow cook” the rice so that it has the best texture and flavor possible. But let us mention again that there is a programmable timer on this Zojirushi NS-LAC05 unit. To conclude, another important thing for us to mention is that if folks are considering the Zojirushi NS-LAC05 for making mostly white rice, there really isn’t going to be a major difference in quality compared to less expensive micro-computerized units. While it is true that white rice will have greater texture and flavor when compared, this unit should be purchased for its diverse benefits as well. We have heard several customer feedback comments that state this Zojirushi 3 cup rice cooker makes brown rice to near perfection which is sometimes challenging to get just right. Overall, another great model in the Zojirushi rice cooker line up!